For many of us our notebook is our main computer, or even our only computer. We explored this a few months back. Notebook sales have exceeded desktop sales for the last year or so, and the trend is likely to continue. The main attraction of a notebook is portability in a reasonably sized form factor (although those 10 pound behemoths stretch the definition of “portable”). With the need (real or perceived) to be connected all the time to our email accounts, blogs, and the entire World Wide Web, it’s no wonder that we can’t seem to leave our notebooks at home anymore. Heck, even hotels on the beach in Hawaii offer WiFi access! For the advanced notebook user on the go, more than just the notebook always travels. A bag stuffed full of accessories also comes along (incidentally, ever notice that the smaller the notebook, the more accessories the guy or gal seems to have with them? It makes me wonder if they should just buy the larger, better featured notebook to begin with). The other essential component, for anything further than the backyard, is the power supply and its cords. Sure, we’ve been promised an eight hour battery life with a miserly processor that sips electrons one at a time. The reality is that the computers we tote along have only a two to three hour battery life, with everything brand new. Using the wireless capability diminishes the untethered time even faster. To finish watching that DVD of “The Aviator” (2 hours and 50 minutes without the special features), you better not forget the power supply and cord. The frequent traveler looks to ease the pain of packing their notebook bag. For example, my Averatec uses two cords. One attaches to the computer and the power supply. The other connects to the wall outlet. I generally wrap them up separately, each in its own plastic bag. Each time I wound the thin cord up to stuff it in the bag, I wondered if I really was supposed to take it anywhere as it is somewhat fragile. When not on the road, I keep the wires plugged in at home. The cord and power supply definitely take up too much room in my notebook bag. I’m looking to ease the ordeal of packing up, every time I take the notebook with me, which is several times a week. Even though I’m not going cross country, whatever I can do to streamline the process is a big plus to me. 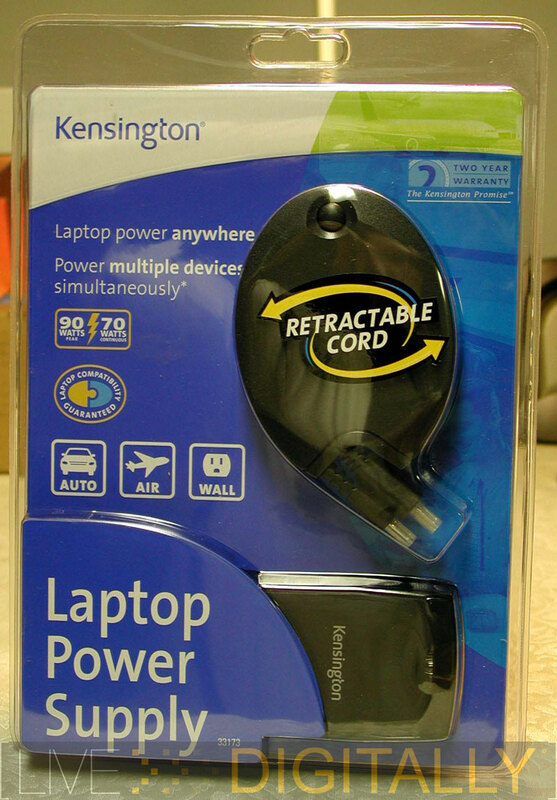 Kensington is a leading manufacturer of computer accessories. They are perhaps best known for their mice, and they manufacture a full array of products and accessories including notebook power supplies. Today, we’ll be looking at their Universal Laptop Power Supply. Let’s see who can most benefit from this accessory. 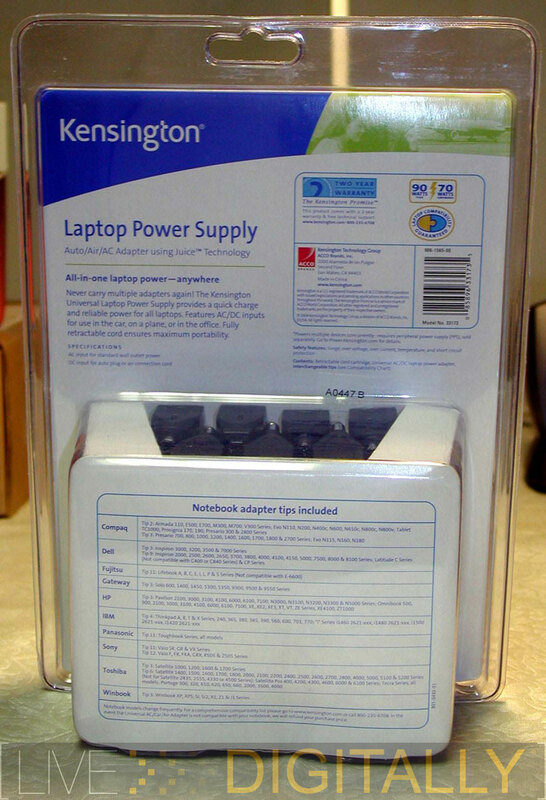 Looking at the various parts of the Kensington package, I immediately recognized the power supply. It is very close to weight and size of the power supply that came with my notebook. It has a blue LED that glows when plugged in. It gets warm to the touch when in use. The power supply is constructed out of an attractive clear plastic over a dark smoky gray. This will complement most notebooks and decors. It has two receptacles for plugs on it, one on each side. In short, it is very close to my original power supply. Kensington’s features Juice Technology to provide “reliable power;” I’m not quite sure what that really means. The next component is the retractable cord cartridge. This is somewhat different than the usual OEM fare. This features a plastic cartridge with 2 sets of wires that can be pulled out. A clicking sound accompanies the pulling. One wire attaches to the power supply, and the other to the tip (described in the next paragraph). There is a button to rewind the wires automatically into the case. The whole thing reminds me of the electrical cord on my Kenmore canister vacuum, and this is a clever implementation of this type of technology. Be aware, the two tips are not the same, and each is specific to what it should be attached to. One of the cords from the retractable cord case goes to one of the interchangeable tips. The system includes seven different ones to fit a very wide variety of laptops. 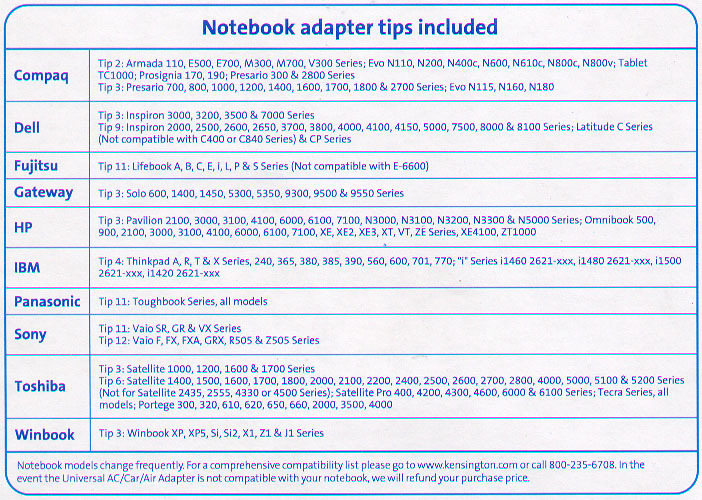 There is a chart that tells you which tip to use with your laptop. Even though my laptop from Averatec wasn’t listed, I easily matched up the correct tip without any difficulty. The system carries the “Laptop Compatibility Guaranteed” logo, and they mean it (or your money refunded reportedly)! The final wire to connect is from the power supply to the power itself. Here, you have a choice to make. You must choose between AC wall outlet power, and DC power from an air or auto outlet. In the car, for the less politically correct, it is a cigarette lighter adaptor. It is very useful that the power supply can be powered from either source. Therefore, on your next trip, you’ll be able to power your notebook from the hotel room, the airplane, and even the car. 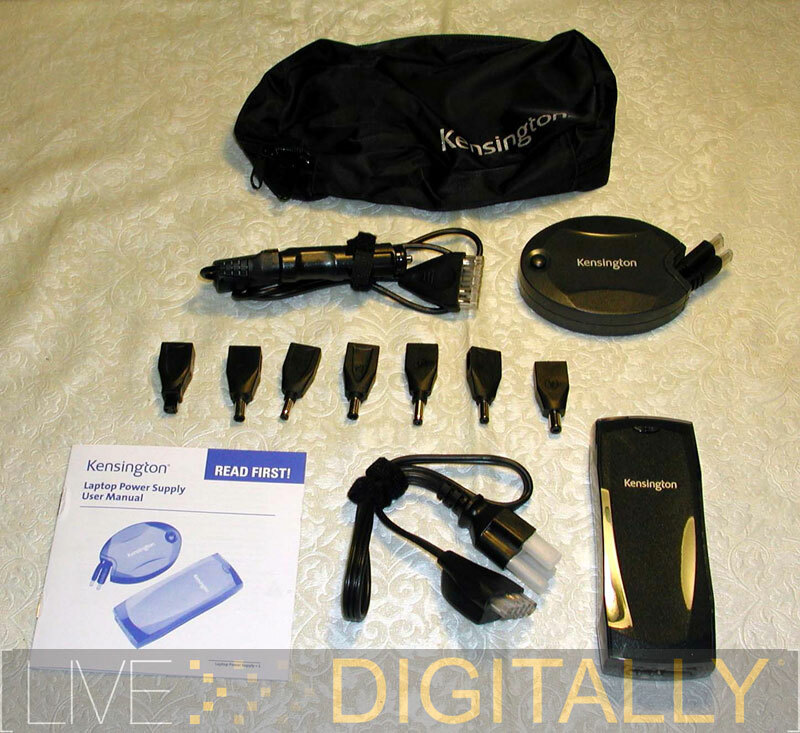 This is a very versatile connection, and means you won’t have to take along a separate DC adaptor, so Kensington’s power supply covers a variety of needs. There is a Velcro strip to keep the cord controlled when in the case. Official Disclaimer: We do not recommend using your laptop computer while driving on interstate highways. I personally guarantee you that State Troopers will not be amused by web surfing at highway speeds. When caught, prepare to cancel all hotel reservations, as you will be spending the night in the local jail. While the above description seems lengthy, assembling the power supply takes only a minute or two. Also, you’ll be able to leave the 6 other tips at home that your notebook doesn’t use. Furthermore, if you don’t plan on using it on the plane or in the car, you can leave the DC adaptor at home. When you have chosen the appropriate components for your jaunt, they all fit in a zippered pouch that is included. This makes it take up less space than my manufacturer’s power supply system. The pouch is plenty roomy, and could easily accommodate your notebook mouse as well. 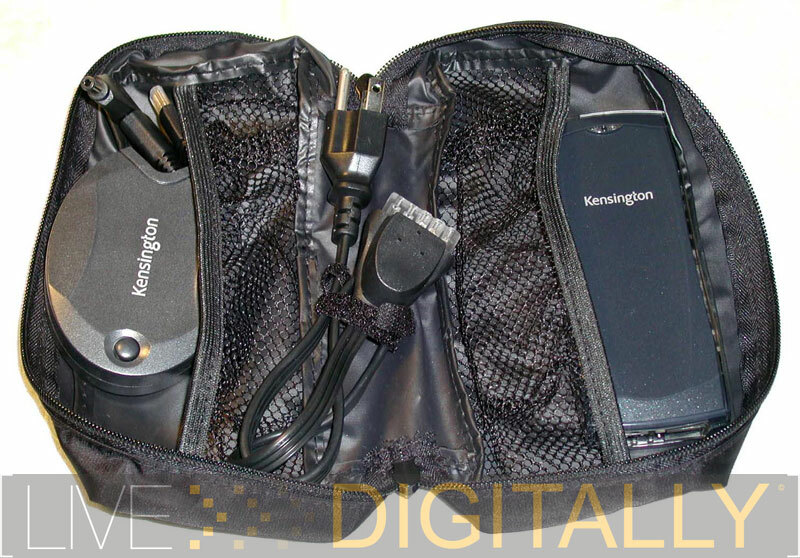 I used Kensington’s Universal Power Supply over a period of a few weeks for the purposes of this review. My notebook was fully powered at both home and work without any issues. The car adaptor worked fine as well. Predictably, with the extra space in my notebook bag, I just found more “junk” (aka: accessories) to fill it up with. The more you travel with your notebook, the more you’ll wonder how you ever got along without it. Getting it setup, and stowed back in the bag is a real snap with the clever retractable cord cartridge. It also looks real sharp in use, and will definitely impress your colleagues as a conversation starter. 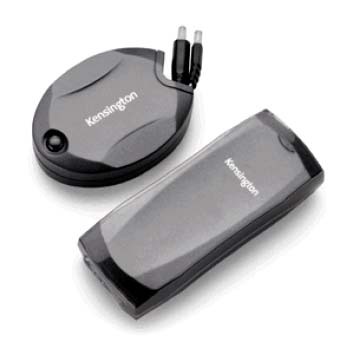 Whether you travel around the world, or down to the local Starbuck’s, Kensington’s Universal Laptop Power Supply should be along in your notebook bag. If you need to travel with more than one notebook, this may lighten the load. You’ll be able to juice up more than one notebook (although not simultaneously) with this device. Make friends with your local chiropractor, you’ll likely need their services somewhere along the way from toting all this with you. For those who think that driving around all weekend with an antennae on your roof hooked up to your notebook, just to document the wireless networks in an area, I have two thoughts for you. First, with the Universal Power Supply, your notebook will be fully powered from your cigarette lighter for the duration. Second, there really must be something better you can do with your time. This is an excellent product, and about as versatile as a notebook power supply can be. It is awarded the “LD Approved” distinction. Frequent travelers will benefit most from this, but even if you don’t go through airport security often, if your notebook leaves your home, you should bring this along. Is there anywhere I can just buy the tips to the power cord? I have the power cord and I have an HP computer and the tip broke so I was wondering if there is anywhere where I can buy a replacement “E” tip.